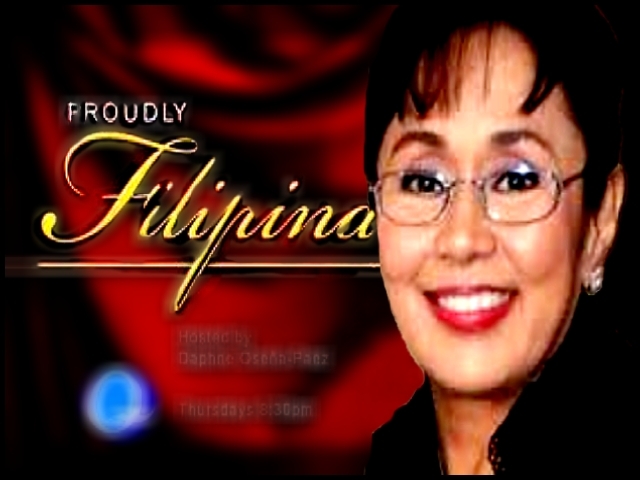 Proudly Filipina is a magazine show on QTV-11 focused on women achievers. Originally hosted by Daphne Oseña-Paez in 2006 but was replaced by beauty title holder/actress, Charlene Gonzales in 2008. The show was cancelled in 2009. Charlene Mae Gonzales Bonnin Muhlach is a television and film personality and former beauty queen from the Philippines. Gonzalez won the Binibining Pilipinas-Universe 1994 title and represented her country at the Miss Universe 1994 pageant held in Manila, where she won the Best National Costume award and was one of the top 6 finalists. Born to actor Bernard Bonnin and model Elvira Gonzales, on 1 May 1974, she has a brother, actor Richard Bonnin. She married Filipino actor Aga Muhlach on May 24, 2001, and they have twin children born in 2001 named Andrés and Atasha. She is also a talk show host and a commercial model (Wikepedia).